Atari released the Road Runner game in 1985 and is based on, you guessed it, the Road Runner cartoon. 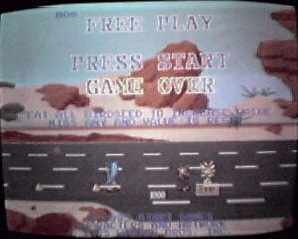 In this game, you play the role of the Road Runner and your objective was to keep away from Wile E. Coyote at all costs. There are numerous obstacles to avoid such as: cars, mines, and the Coyote himself along with his bag of tricks. One unique feature or this game is the Hall-Effect joystick that you use to control the Road Runner. It operates by electromagnetic force so you can move the Road Runner at different speeds depending on how far the joystick is pressed. 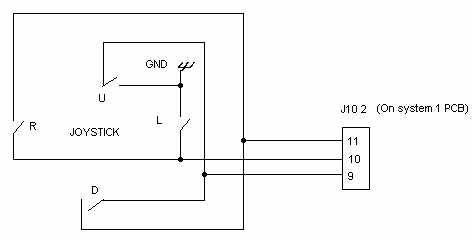 I have a hack pictured below that will allow you to use a regular 8-way joystick in place of the Hall-Effect one. The 8-way stick may not be as responsive as the Hall-Effect but it is an effective substitute since the Hall-Effect controls are now getting harder to find. There was also a option for use of a ticket dispenser with this game and if anyone has more information on this let me know.